Buckland Abbey was the home of Tudor England’s most infamous seaman, Sir Francis Drake. He bought Buckland Abbey with his share of plunder after his circumnavigation of the globe from 1577-80. Buckland Abbey remained in his family until the 1940s, when a fire caused severe damage to the home it was gifted to the National Trust. Buckland Abbey’s gardens have been reconstructed in a late medieval style. The borders are full of bright and aromatic plants that fit in with the abbey setting including old irises, columbines, peonies and delphiniums. There also is a medieval meadow garden that was the height of fashion during the medieval times of the Cistercian monks. Ragged robin, ox-eyed daisies and other plants were firmly established in the soil, then, a carefully selected grass was laid. The long grass is full of wild tulips, narcissis, scabious, musk mallow, poppies and other wild flowers. Buckland Abbey was the home of Tudor England’s most infamous seaman, Sir Francis Drake. Drake was born sometime in the early 1540s at Crowndale, Devon and rose from humble farming beginnings to become one of England’s most famous seafarers. He was revered in England as a heroic commander and adventurer and feared and detested by the Spanish as an unscrupulous pirate. He bought Buckland Abbey with his share of plunder after his circumnavigation of the globe from 1577-80. Buckland Abbey remained in his family until the 1940s, when a fire caused severe damage to the home it was gifted to the National Trust. 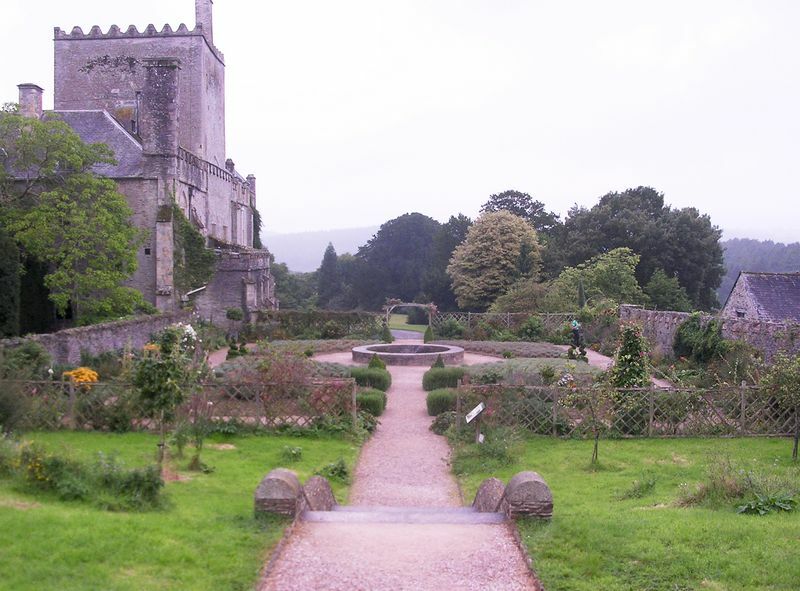 Buckland Abbey’s gardens have been reconstructed in a late medieval style. A Tudor garden has been recreated on the north side of the abbey, replacing an ancient and much loved line of yews that had succumbed to root disease. Four beds, one of lavender, one of rosemary and two full of old varieties vegetables surround a circular pool and fountain. The borders are full of bright and aromatic plants that fit in with the abbey setting including old irises, columbines, peonies and delphiniums. Beyond this is a medieval meadow garden that was the height of fashion during the medieval times of the Cistercian monks. Ragged robin, ox-eyed daisies and other plants were firmly established in the soil, then, a carefully selected grass was laid. A cut is made once a year in September after the flowers have shed their seeds. The long grass is full of wild tulips, narcissis, scabious, musk mallow, poppies and other wild flowers. The cuttings are removed because most wild flowers prefer a low fertility of soil and traditionally these cuttings would have been used to feed cattle and herbs. Grass cuttings were also spread on the floors of building, when it became dirty a new layer was strewn down over the top. The mead attracts admiral and tortoiseshell butterflies and the dark dagger and elephant hawk moths, among other moths and butterflies. 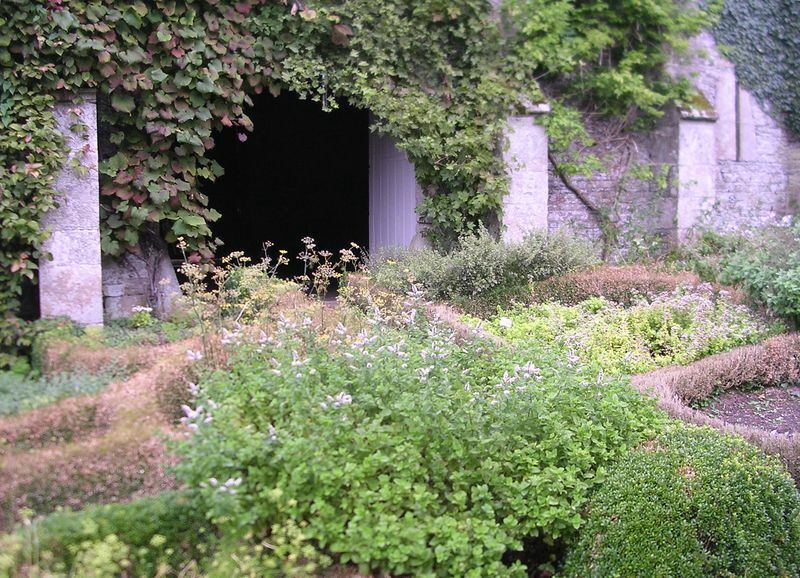 Behind the massive Cistercian barn is an extensive herb garden planted with the aid of the famous twentieth century garden designer Vita Sackville-West. Fifty-two beds edged with neatly clipped box are packed with a wide variety of herbs grown not only for their medicinal values, but also for their gorgeous smells and appearance. The rest of the grounds were overgrown with huge trees at the beginning of the twentieth century, which have now been cut down and made into a vast lawn. Some magnificent traditional English trees still remain overlooking the lawns. Efforts have been made to introduce and cultivate plants that were introduced to England during the late sixteenth and early seventeenth centuries in the herbaceous borders, linking back to the time of Buckland Abbey’s most famous and boldest sea-faring owner. Drake died at sea on the 28th January 1596 and was buried in a lead coffin just off Porto Bello. Among the many artefacts at Buckland Abbey, his drum is the most unique. It is said that when England is in danger of being invaded Drake’s drum will beat, recalling him to save the nation. Admission by timed ticket at busy times. Last admission 45 minutes before closing. Winter admission (1st November – 18th March): reduced price for house; grounds free. Shop: National Trust Shop. Independent craft workshops open near the abbey. Tea Room/ Restaurant: Licensed restaurant/tea-room in reception building. Restricted menu from November to March. Children’s menu available. WC: Baby changing and feeding facilities. Parent and baby room. Adapted WC next to main WCs. Parking: Free parking, 150 yards from the entrance. Separate disabled parking with transfer available. Seats and benches: Seating is provided in the gardens and house. Average visitor duration: 1 to 2 hours. Accessibility: The sensory list reflects the 700-year history of the house. 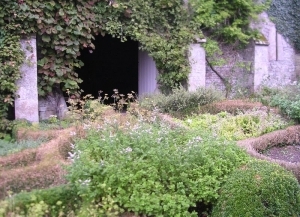 The garden includes a scented herb garden, which is at its peak between June – August. Ramped entrance to the property. 2 wheelchairs available. Ground floor has steps. Stairs to other floors. Seating is available and audio visual/video, interpretation material from inaccessible floors is available. The grounds are partly accessible with slopes. There is a map of the accessible route and a staff driven multi-seater vehicle. The shop has a low level counter but a wooden lip to the doorway. The restaurant has a level entrance with a wooden lip to doorway. A Braille guide and large print guide are available. There is an induction lip in reception and a subtitled version of the introductory film is available on request. Four ways marked walks through woodland and farmland, map available from reception. Bus: Plymouth Citybus 55 from Yelverton (with connections from Plymouth railway station) can be used on Monday, Tuesday, Wednesday, Thursday, Friday and Saturday. The First 48 can be used from Plymouth on Sundays. Cycling: NCN27 runs within two miles of the abbey. See website for local cycle routes. Road: The Abbey is six miles south of Tavistock and eleven miles north of Plymouth. Turn off the A386 south of Yelverton. From here the Abbey is well signposted. Free parking at site. Train: Beer Alston station is four and a half miles from the Abbey.